HOW DO IONIZATION SMOKE DETECTORS WORKS? 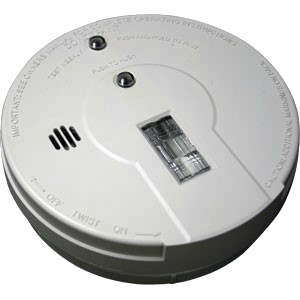 All smoke detectors consist of two basic parts: a sensor to sense the smoke and a very loud electronic horn to wake people up. Smoke detectors can run off of a 9-volt battery or 120-volt house current. Ionization smoke detectors use an ionization chamber and a source of ionizing radiation to detect smoke. This type of smoke detector is more common because it is inexpensive and better at detecting the smaller amounts of smoke produced by flaming fires. Inside an ionization detector is a small amount (perhaps 1/5000th of a gram) of americium-241. The radioactive element americium has a half-life of 432 years, and is a good source of alpha particles.